We have RAIN today! We have had a dry spell or mostly so. It did rain on Monday but not enough to brag about. Today I think we might get some bragging rights. But since we only get about 12 inches of rain per year on average, any rain is a welcome sight! I got another new recipe today that I can hopefully share with you next week. I want to make it first to be sure it's as good as it looks. The recipe is for Homemade Wheat Thins! I love Wheat Thins and to be able to make them at home would be great!!! My card for you today is one we made at our Happy Stampers Club meeting last Wednesday. I like this style of card so much I made 4 of them! I made a birthday card using black and white that I will show you next week. Please forgive the photo as I was holding the card open with one hand while trying to take the picture with my iPod Touch. 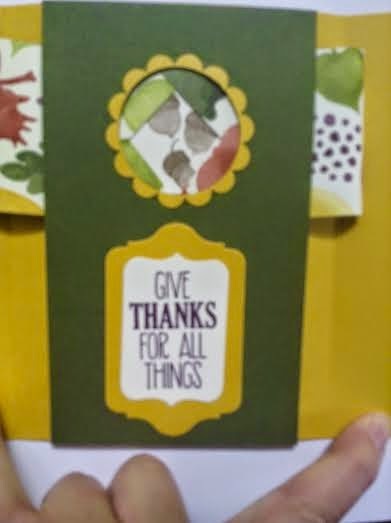 My thanks goes to Dawn Griffith for the wonderful video tutorial for this card! You can view the video at Dawn's Stamping Thoughts. Her videos are amazing...easy to follow along! Well, I'm off to clean my house before company arrives later today! I also plan to make a big pot of All You Can Eat Soup and a couple loaves of Whole Wheat Bread so I best get busy! Have a great day and thanks for stopping by! 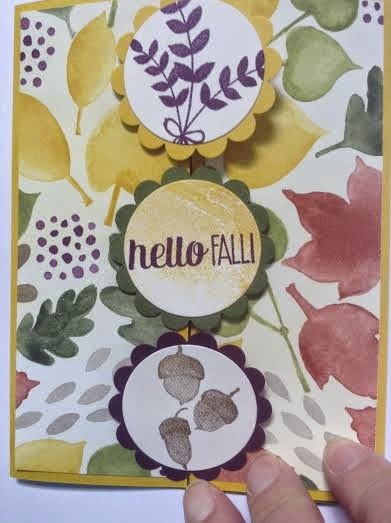 Labels: All-You-Can-Eat Soup, Dawn's Stamping Thoughts, For All Things, Peekaboo Window Card, Stampin' Up! Beautiful work on the cards!